As more corporations with different risk tolerances seek to procure renewable energy, the standard power purchase agreement does not suit them all. 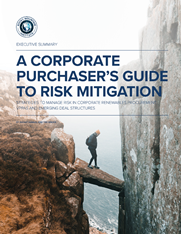 RMI’s new report details risk mitigation strategies for corporate buyers of clean energy that give them a new menu of options for managing risk in long-term deals. K&L Gates Portland partners Bill Holmes and Teresa Hill provided insights on the development of this report.